Edens Structural Solutions is a foundation and slab repair company serving Oklahoma City. We custom manufacture our own piers, which allows us the flexibility to make sure Edens Structural always offers the right solutions. This is just one of the many reasons why we have been successful serving slab repair customers in Northeast Oklahoma for over 30 years, and now serving Oklahoma City! Give us a call today at (405) 260-9320. Many of our customers require interior concrete slab repairs, in conjunction with the exterior piers, to repair their foundation. 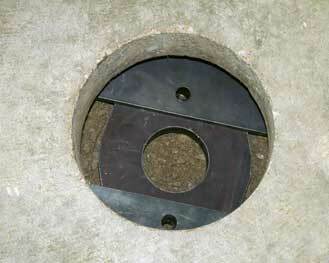 Helical piers are used often when re-leveling large area concrete slabs. A high torque rating machine is used to drill helicals through the concrete slab and into the ground. After the piers have been installed, the lifting process begins by means of a lift assembly. No matter how many piers are installed, a zip level is used to verify the levelness of the slab before and during the lift. After lifting is complete and the concrete slab is level, the pier holes are filled with concrete. We recommend plumbing pressure tests be performed prior to and after the lift to ensure there are no leaks caused by the lifting process. Drilled piers may be required to drill through rock, then the pipe can be inserted in the hole, and the same process will continue as the helical installation for concrete slab repair and leveling. Concrete slab removal and replacement may be an option if the slab is broken and cracked beyond repair. While this is not often the case, Edens has the equipment to tackle this type of slab repair. The damaged portion of the slab is removed, and the soil is re-graded and compacted. Afterwards, a 4ml vapor barrier is installed, followed by installing ½” rebar as required. The slab can then be re-poured and leveled for proper foundation repair. This method of concrete slab repair has become the most effective means of repairing large cracks in the concrete slab. A slot is cut perpendicular to the crack and a piece of rebar is installed and epoxied into the slot. We offer concrete lifting foam solutions to homeowners in Oklahoma City. Click here to learn more about Edens Structural Solution’s polyurethane foam injection. Call Edens Structural Solutions at (405) 260-9320. We offer foundation repair in Oklahoma City and surrounding areas, with over 30 years of experience. We have built a reputation with industry leaders and homeowners for expert, professional service and custom solutions. We fix foundations right the first time!